As a music-oriented handset Nokia 5310 is supposed to excel in terms of audio quality. As it turns out it is quite up to the task. The handset has excellent noise levels and dynamic range. It is also doing quite well when it comes to frequency response. On the other hand it has rather high IMD and THD levels and not the best stereo crosstalk. Still these are all not too bad so we would qualify the audio quality of Nokia 5310 as good. You can find more info about the test itself here. No significant changes in the gallery were made with Nokia 5310. That's a pity, as we aren't really in love with the looks of the S40 gallery. Probably a part of the problem is that it is used as a file manager too. There are three different views for the gallery: list with details, list and grid. Once you pick a picture you can zoom on it to see more detail. Zooming itself is not the fastest around (especially for larger pictures) and doesn't allow a picture to be zoomed in too closely, so actually it is not much of a help. The pictures can also be viewed in fullscreen and can be edited with the built-in picture editor. The latter offers a decent amount of options, but you will hardly end up editing your photos on your 5310. The final extras of the gallery include the available Slideshow and Search options. The latter is quite convenient for finding a specific file in overfed folders but we still believe that the gallery on S40 is not Nokia R&D team at their best. That goes true especially in user friendliness and we do hope that sometime in the future the file manager and the gallery of these phones will be separated. Speaking about multimedia capabilities, the camera is one of the most important things to mention. Nokia 5310 is armed with a 2 megapixel camera with image resolution of up to 1600 x 1200 pixels. Typical of Series 40, the camera settings are not the richest around but are still reasonable for this shooter. They include white balance settings, three quality levels going form basic to high, and various effects. Sequence shots and shooting in both portrait and landscape mode are also among the available extras. The camera itself is not the best we have seen either. Frankly, it is not even near average level. It has no lens cover to protect it from scratches. The lack of flash dooms night photos, while the fixed focus is surely to ruin any attempt at a close-up. The lack of a dedicated camera button is another real downer when it comes to operating the camera. It is quite uncomfortable, especially when shooting in landscape mode, to use the confirm button of the D-pad for that purpose. Photo quality is below average; in favorable weather decent images can be produced, sharp enough, with less blown colors. The noise levels are high in areas with no detail like the sky for example. Given the absence of autofocus, you'd rather not take a picture of a closely situated object or text, as they will surely be blurred. Text is only legible if captured from a distance. Finally we need to warn you about the camera speed. This one is surely among the slowest we have tried recently. It will take ages to save a picture at the highest resolution and that stretches the shot-to-shot time considerably. "...The handset has excellent noise levels and dynamic range. 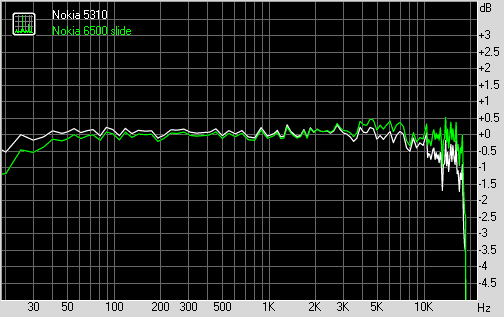 It is also doing quite well when it comes to frequency response. On the other hand it has rather high IMD and THD levels and not the best stereo crosstalk..."
Another disappointment is the QCIF video capture resolution of the Nokia 5310's camera. The length of videos in 3GP format is only limited by the free memory available but this is not much of a relief. Zooming is also available but that cannot stop us from calling the video capturing a disaster. This may as well be true for the overall camera experience for that matter. Connectivity is at about the level you would expect from a handset in this price range. The best performer here is the USB connectivity, which is really seamless. Upon connection of the USB cable, it prompts you to select the connection mode. On the other hand the microUSB is not as widespread as the miniUSB, but this may just be how the future is shaping. You can then alternate these modes by only a few keypresses. Moreover, Mass storage is available, allowing your phone's memory to be directly accessed from a computer. The Bluetooth version is 2.0 and it supports the A2DP profile, which allows a stereo wireless connection. The rest of the connectivity options include the network support - unluckily Nokia 5310 does not support 3G and relies on EDGE and GPRS only. There is no infrared port on the device either, but this is not much of an issue to us. Finally, the memory card slot, which can sometimes be the most convenient way of transferring information, is also present here. It is somewhat uncomfortably placed under the battery cover but still this is only a minor obstacle.